On Relatively Prime we talk a lot about mathematicians and their research, but it has been a long time since we have talked about an absolutely integral part of how people end up becoming mathematicians and doing research…Math Teachers. After all if there were no math teachers then who would first tempt us into the world of mathematics with wondrous things like factoring, which is totally what got Samuel hooked. Hey don’t look at them that way, they just love a good difference of two squares quadratic. 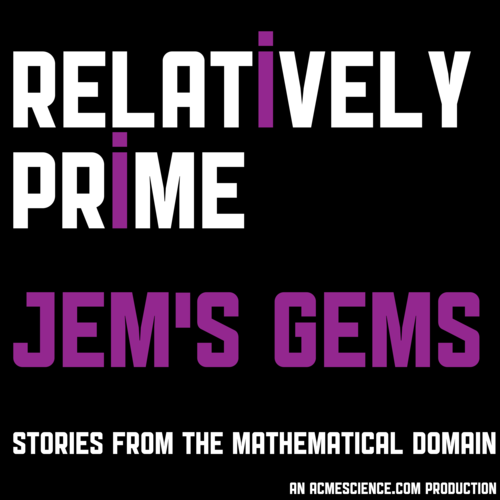 On this episode of Relatively Prime Samuel speaks with mathematics teacher Jo Morgan. They discuss how Jo went from banking to teaching, how twitter totally changed Jo’s teaching practice, and the work Jo does helping teacher to find resources to use in their teaching. To learn more about Jo follow her on twitter and check out her blog Resourceaholic.com.